I like it. It's so hilarious! I love this date's strip! I'd like to share it with my students who might need to be reminded of this. How would I go about that? Below the "support Patreon" you encouraged us to annunciate. I think you meant enunciate. https://www.dictionary.com/browse/annunciate Though, it is in the Christmas spirit to remind us to annunciate- like the angels did, announcing Jesus' birth to the shepherds. You're right, I did mean enunciate! It's all part of that old laundry flowing out of my mouth. Glad you liked it! You can share it however you want - there's the website link, or you can just copy the comic to your phone / computer and email it, or you can use Facebook or Twitter under the post. Your choice! This is so true! 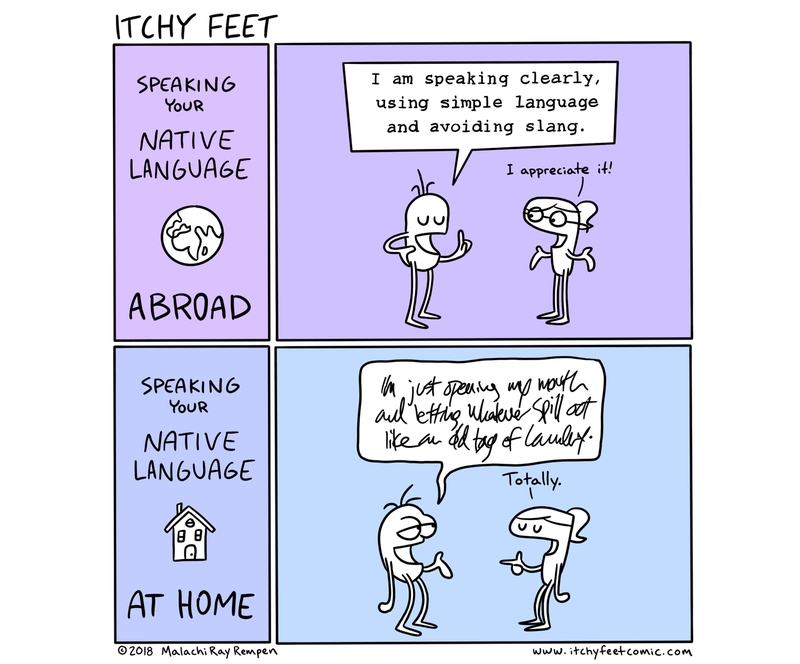 If only native speakers did this to non-native speakers learning their language in the native's country 😏. When I look at you like you're crazy that means I don't understand. Please help me out and enunciate! PS : j'ai cru voir passer une traduction en coréen, et comme c'est le langage que j'étudie ça m'interessait... mais je l'ai perdu et je ne le vois pas sur le site ... quelqu'un aurait l'adresse ? I think I saw an Itchy feet Korean translation (which is the language I'm learning at this moment) but I can't find it and the link seems not to be on the page. Has someone the link ?